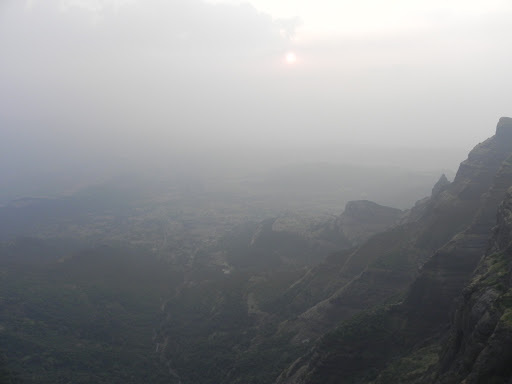 Harishchandragad a vastly built fort in the Malshej Ghat of Maharashtra is an exotic place. It’s a huge fort with many spots of fascinating attraction and many mythical stories around it. The fort combines myth and reality and is wonder of nature. The fort is named after a renowned King Harishchandra; who after sacrificing his Kingdom had sent his wife and son in south. The wife and son had lived on this fort as servants. 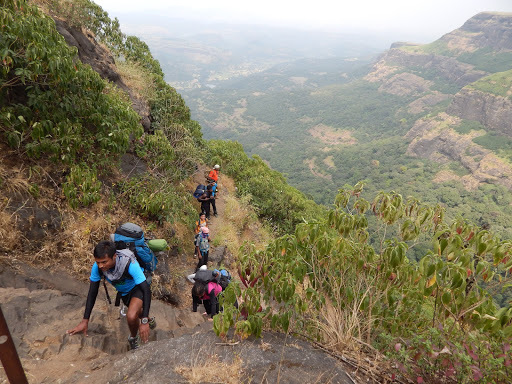 It is one of the most difficult trek in Maharashtra and tests patience of a person. 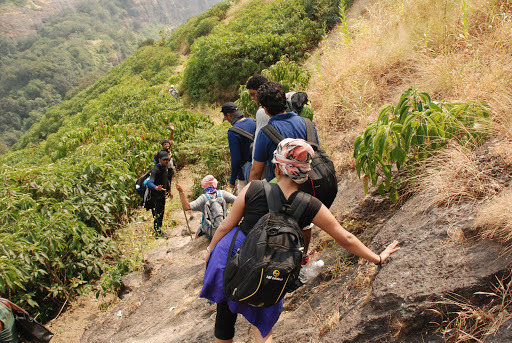 As a goal of taking people on adventurous path, Small Steps had planned this trek from Khireshwar-Tolarkhind route. The other routes are Nalichi Vat which is much more difficult than former and truly needs expertise in trekking and lots of stamina. The other route is from pachne village. It is quite easy and one reaches top in no time also scenic beauty along this route is great, with ponds and waterfalls on its way. Starting in the morning of Saturday from Thane station in Mumbai at 7, a private bus was arranged. We reached Ahmednagar district where we took a turn from Khubi Phata. As our route was from Khirshwar-Tolarkhind. We reached Khireshwar village in around 3 hrs. at 10 am. Khireshwar village is situated in the foothills of the fort. The skyline view of the fort and hills is visible from here. 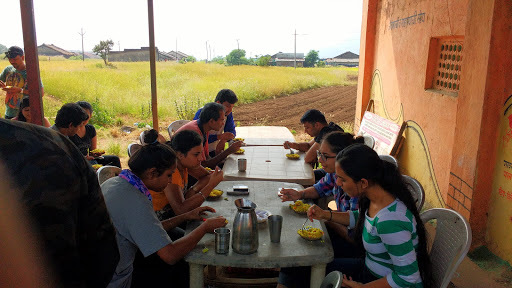 Delicious breakfast of Kande-Pohe was served ‘speciality of small steps.’ We got introduced to each other. For me a frequent trekker with Small Steps; there were many new faces. 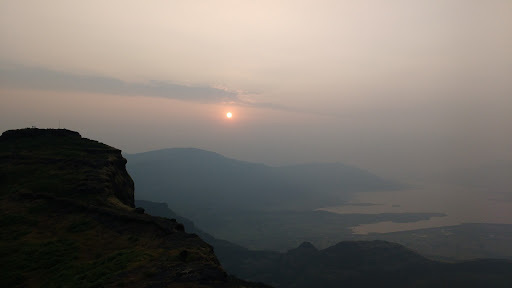 With introduction done we got set and ready for ascending the Harishchandragad fort. The Skyline view of the fort from base village. The trek from Tolarkhind is a difficult one, no sooner than we started ascending everyone felt breathless and tired. The cool breeze in midst of daylight was a relief. There are 7 hills that need to be crossed to reach the top. 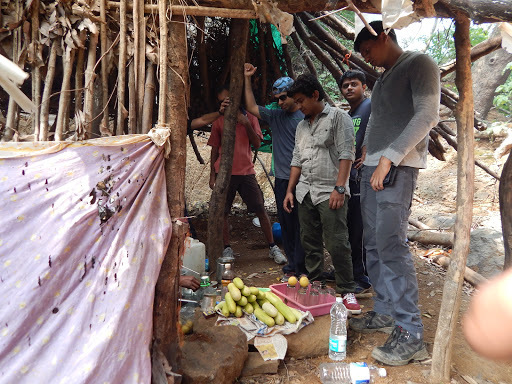 As harishchandragad trek is one of the well known weekend getaways near Mumbai, villagers seem to open hut sized shop near all the major halts. Believe me one needs them as you are exhausted. The refreshments energized us to continue ahead. We were also carrying tents for camping; it added weight to our baggage. There are steep rock patches in between and also an opportunity for enthusiast climbers to climb them. Many of us did climb; the rocks had crevices to grip our hands. Others took safer way up. 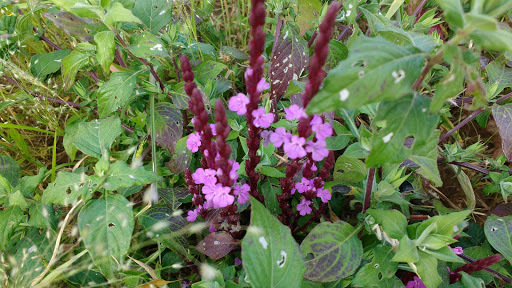 The mountain has abundant flora and fauna. Greenery is spread all over them. 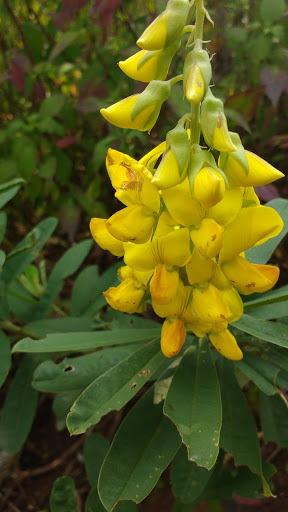 Amazing blossomed flowers also can be found on the way. It took nearly 4 hours of trekking to cross the 7 hills to reach the top. We were divided into three groups with as usual Sagar leading, Chaitrali (also a frequent trekker with Small Steps) and me in between connecting the groups, and at the last Yogi with dawdling trekkers. After reaching top we had to walk for nearly one and half hours further to reach an ancient temple. We had started approximately at 10 am and reached temple at around 3 pm. Still Yogi’s group hadn’t come. Reached the top but still need to walk. The exploring of fort and architectural Wonders. one big. These reservoirs were also built in olden times. The reservoir at one edge has a short wall and is carved inside with different deities. If we walk further right to this temple and descend for a while one finds an amazing cave carved from in rock with a Shiv Linga at centre of it. It is filled with water till waist height. The water is perennial in it. The cave itself has four pillars of which 3 are broken and now is supported by just one. Here the myth of fort starts; it is said that 4 pillars represent 4 Yugas of Hindu Scriptures and as 3 are over they are broken when the 4thbreaks the last Yuga will end. Keeping aside the myth it is a wondrous cave and looks beautiful; the water inside is ice-cold and teeth chattering. 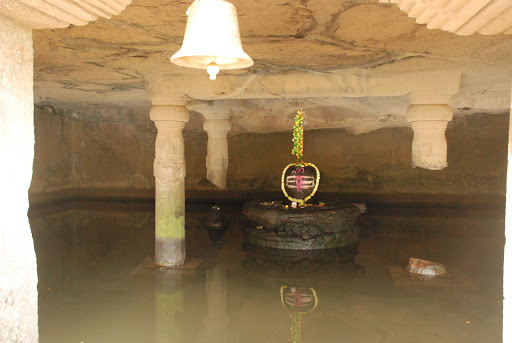 Kedareshwar Cave with Shiv linga, amazing.! As Yogi’s group arrived; Sagar the lead took off with Chaitrali. Yogi and I waited till last group rested and had their lunch. It was around 4 in the evening. 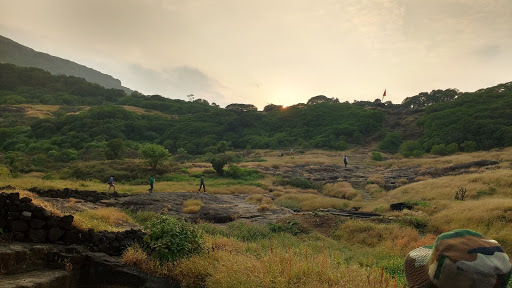 We started our journey to most awaited spot of the trek, ‘Kokan Kada.’ Walking further one arrives at a small heighted temple of Sage Vishwamitra. It is said that in that here he used to meditate. Kokan Kada, Nature is inexplicable. As we walked for an hour or so Konkan kada came into our sight. We reached the very end. Konkan kada is an inexplicable place. It is a flat surface and shaped like a curvature. Vertically flat and has height of about 3000 ft above sea level. It is called Konkan Kada because from here you can view Konkan on other side. A view that exhibits personified nature and leaves your head spinning. To have a thrilling experience; we slept on our bellies and looked down, and the depth never ends. The villages far away seem tiny toys like. Activities like rappelling also take place here but strictly arranged by professionals. After watching for quite some time and not feeling fulfilled; we got up and had some tea sold by villagers. The selfie’s and photos followed as they always do. The tents had to be pitched. Sagar had reached earlier and pitched most of the tents with his group. We erected reaming few. It was around 7 pm. 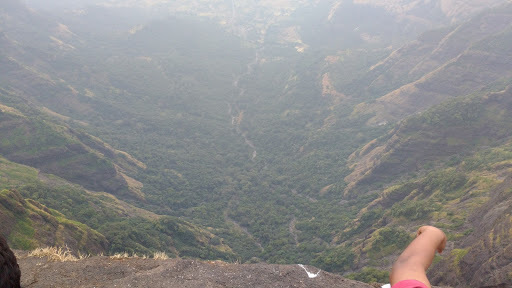 Konkan Kada;Down we look into the valley. Tents pitched on camping site. The Fort has many caves, mostly people stay in caves during dry seasons. But we had brought tents and so had many other groups. The night was covering sky under its shelter and the darkness was underway. 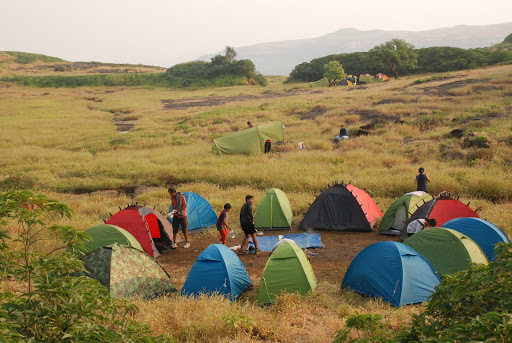 Torches were getting lit up; many trekker groups were camping on Konkan Kada, so in the lights of torch one could see many tents pitched in circles. The villagers set up their huts also nearby in dry seasons. 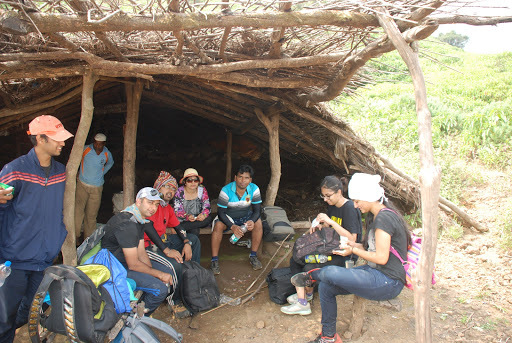 One peculiarity is that the villagers of base village or of fort are of great help during trekking. They live so simple life although having their own set of problems. Sometimes I wonder it will be so peaceful to live in such villages. Well not to digress into my personal trail of thoughts; the villagers provide meal and water. 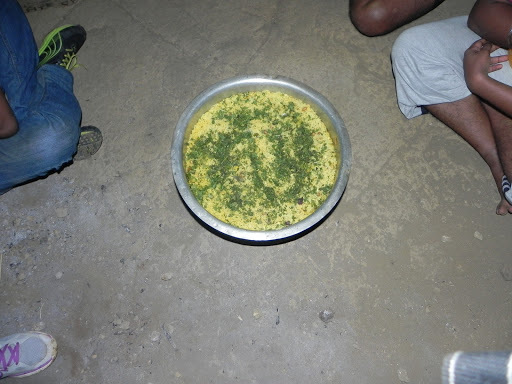 But we had brought our own set of ingredients to prepare food, the locals gave us their utensils and materials to use. Some of us who were good at cooking stayed in the hut and cooked the meal. Rest of us set the campfire and near our tents. We actually tried to roast potatoes on the campfire, but only few succeeded to properly roast it. After some time meal was ready. A great Masala rice was served; it was delicious and tasted awesome served with pickle and I remembered home. We ate stomach full. 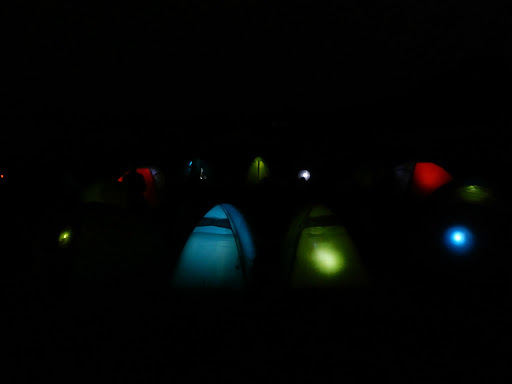 Tents lit up at night. Done with the dinner we retired to camping site. Some of us went to Konkan Kada, it was a cool night and cold breeze was flowing from kada. Engaging in our own activities, at last we slept at around 12 or 12.30 am. The tents provided a warmth from outside cold. 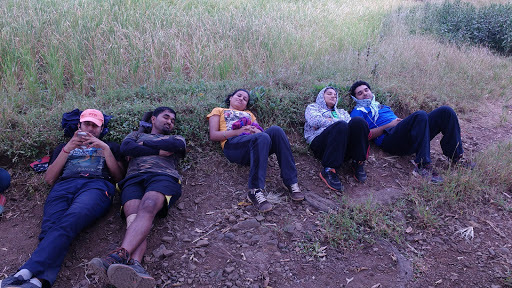 Keeping in mind my last experience of Rajgad to Torna trek where; I had brought a shawl with me. I was awake by 4.30 am and so were many; campfire which had extinguished was lit up again. 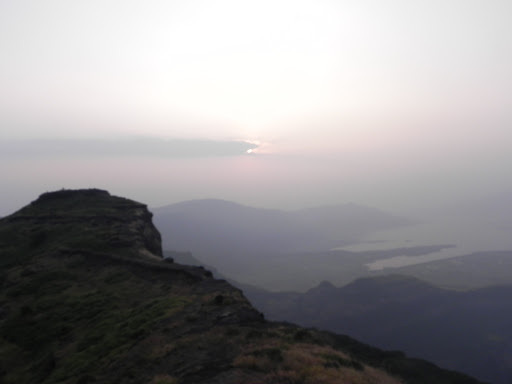 Now the plan was to trek to other great spot Taramati point and watch the sun rise. Taramati is a name of the wife of King Harishchandra. 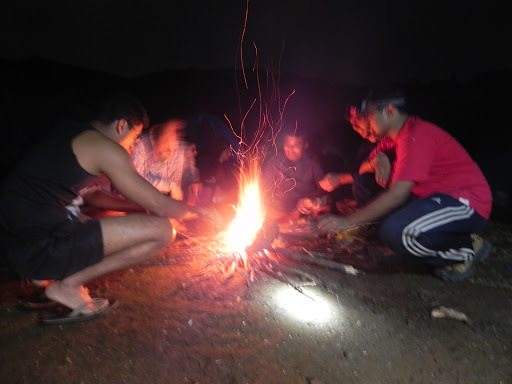 We were taking warmth from the campfire as it was chilling in the early morning; after sometime we started our trek. Some decided to enjoy the sleep as it was Sunday morning. 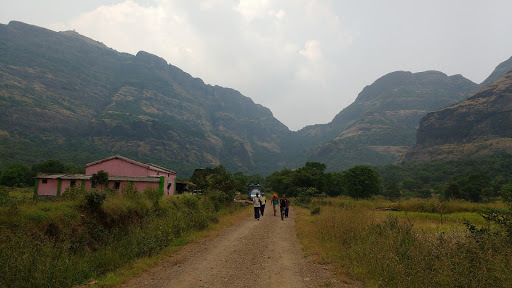 The trek to Taramati is ahead of Konkan Kada parallel. We walked for few minutes and then ascended, and reached to another plateau, again walked and again ascended another small hill, again a flat surface and again a hill. This continued for 6 such hills. In between I felt tired and thought of not continuing, as the ascending patches were steep. But in our group; a married couple had come and they had a young kid of 7 to 8 years. He was enthusiastic about trekking from the start. He had been in lead’s group. Now also he was not walking but running and jumping, taking inspiration from him, I thought I have come this far and should continue and reach the top. So finally after 6 ascensions we reached top at the Taramati point the saffron flag was furling further hoisted near a Buruj. The sky was uncovering from the shelter of night, Sun before rising had spread a saffronish mixed with blue colour gradually the sun was rising. Down on the earth we could see small villages and river flowing by; hills and mountains all around us. It was the perfect beginning of the day; we were on the top of the mountain, at bottom calm and serene river was flowing sun had risen announcing his appearance, birds flying away from nest and flowers blooming in his direction. What a picturesque view. You only see such things in paintings. Well click, click and click many cameras captured the scenes, even the cell phones were out and clicks being taken; soon the trend of selfies followed and the dp’s for social networking sites. With lots of such clicks we started descending back to camp site. 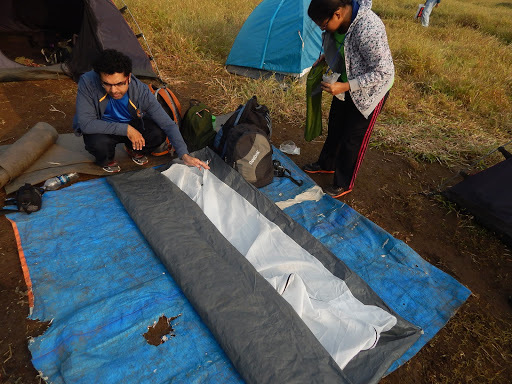 The descension did not take much time and soon we had reached our camp site near Konkan Kada. Taking a glimpse of kada for the last time and of course a group photo. Time to Descend the fort. We packed the tents and our bags. We were ready to climb down now. 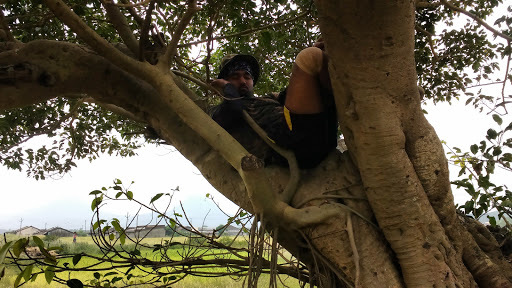 Having a little breakfast and some tea from villagers, the trek back towards base started. We reached the temple and the arched cave of Shiv Linga, from nowhere everyone decided to jump into the lake of cave, and I joined too, my teeth chattered as soon as the cold water hit me and for a moment I couldn’t bring words out of my mouth. It was shivering but after few minutes the initial coldness went away. Plunging into the water and swimming for a while, we came back. I felt great calmness after that, all the exhaustion, tiredness and aching went away, I felt refreshed and re energised. Changing into dry clothes we continued climbing down. The descend was steady and fast, around 10 am in the morning we started. Again the same pattern of grouping followed, while descending now knowing everyone we chatted and sang song and made fun of each other remembering the moments of camping and the night spent. Refreshments were available frequently from villagers. It took about 3 hours to descend; reached around at 1 to 1.30 pm. After reaching the base village and looking at the skyline of fort every one of us had sense of accomplishment. Again the last group was yet to come. 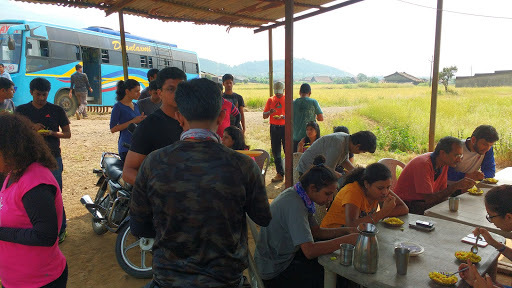 Until then we had our lunch at Khireshwar village same place from where we had started. After that we put ourselves under a tree and relaxed, so serene it felt. Till the last group arrived and had lunch it was tea time. So our trek ended on the tea note. Back journey in the bus was lively no one slept; maybe tea’s effect. The journey completed in talking with each other, sharing of pics, sharing of past experiences and etc. Finally at around 7 pm in the evening we reached Thane station and from here every one bidding adieu dispersed. It was an end to great joy ride and thrilling adventure. 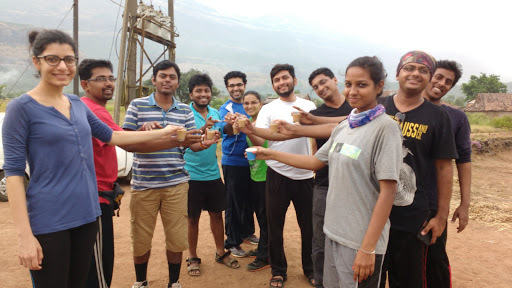 Cheers; ending on a Tea note.I know many trekking groups in Mumbai who organize trek to kokankada and taramati but Small Steps Adventures made this one memorable. Location: Ahmednagar district, ahead of Malshej Ghat. Distance: around 180 km from Thane. Transport facility: State transport buses from Thane – Kalyan till Alephata. From here local transport available.